Completes partial file and directory names given a partial string by looking in the file system for clues. Can return a list of possible completion strings for widget implementation. Obtains a completion for initial_text from completer. initial_text Text to be completed. 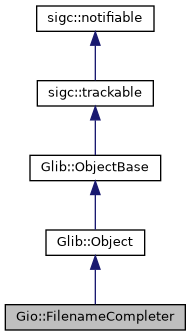 A completed string, or nullptr if no completion exists. Gets an array of completion strings for a given initial text. Array of strings with possible completions for initial_text. This is a default handler for the signal signal_got_completion_data(). If dirs_only is true, completer will only complete directory names, and not file names. Emitted when the file name completion information comes available.